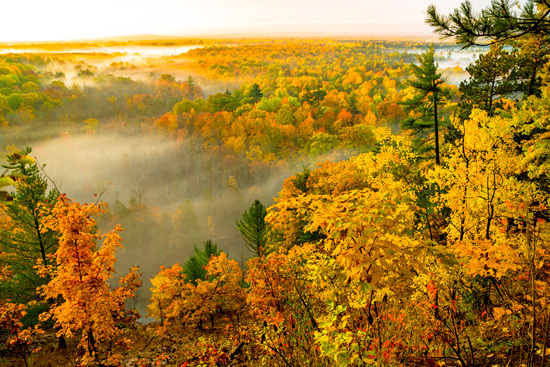 Voted America's 2015 Number One Best Scenic Autumn Drive by 10Best and USA TODAY, M-22 has so much to offer! M-22 is a 116-mile stretch of highway that winds along the Lake Michigan shoreline and through the scenic countryside of Manistee, Benzie and Leelanau counties. Whether you are planning a vacation or just passing through, M-22 has everything you need to enjoy the beauty of Northern Michigan. Charm and adventure rest in every bend of the road, all year long. Although there are many activities and attractions to enjoy while you travel M-22, there is one "don't miss" location that you shouldn't pass by. Known around the world as a marvel of nature, the Sleeping Bear Dunes National Lakeshore is one of the most beautiful, untouched places in Michigan, and M-22 drives right through it. Beginning in Benzie County but with the majority in Leelanau County, this nature reserve is cherished in legends, history and natural beauty. The national park is well protected to preserve the mountainous sand dunes and the shoreline topography. M-22 is more than a destination. It's an experience you will always remember...with a smile! Included as part of the Lake Michigan Circle Tour, the scenic M-22 highway meanders through three counties and many towns which will surely capture your heart. With light traffic and breathtaking views, you’ll treasure every minute of your M-22 journey. Below we will mention the highlights of each M-22 county, with links through to detailed destination pages with more in-depth travel information about that specific county. 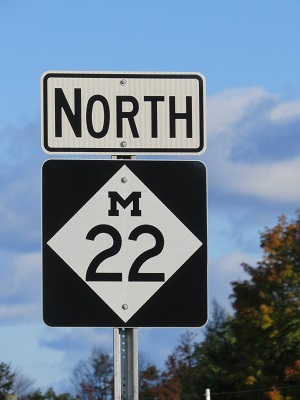 The iconic M-22 Highway begins in Manistee, Michigan and heads north all the way through Manistee County. With historic landmarks, stunning white sand beaches and a downtown buzzing with development, Manistee is the perfect launch point for the M-22 journey. Driving north, you’ll pass through Onekama, known as the "Two Lake Town" with Portage Lake and Lake Michigan within reach. At the northern section of Manistee County, you'll find the small town of Arcadia, and just outside the northern county line, Inspiration Point is a picturesque sunset spot, a very high bluff offering magnificent vistas of the lakeshore. For more information, read our story about M-22 in Manistee County. Entering Benzie County, M-22 curves through the sister towns of Elberta and Frankfort. Frankfort has an exceptional downtown district with fine dining and unique shopping that makes the town feel much bigger than its small size. Just a few miles north, the M-22 highway takes travelers to the turn off for the Point Betsie Lighthouse, a don't-miss attraction while in Benzie County. Point Betsie is a public lighthouse with historic and aesthetic value, and a public lakeshore to explore. M-22 continues along the shoreline of Crystal Lake, named accurately for its breathtaking color--with turquoise hues which are typically found in more tropical destinations. For more information, read our story about M-22 in Benzie County. M-22 continues up and winds around the Leelanau Peninsula, the "Little Finger" of our mitten-shaped state. Empire offers unparalleled hiking trails. 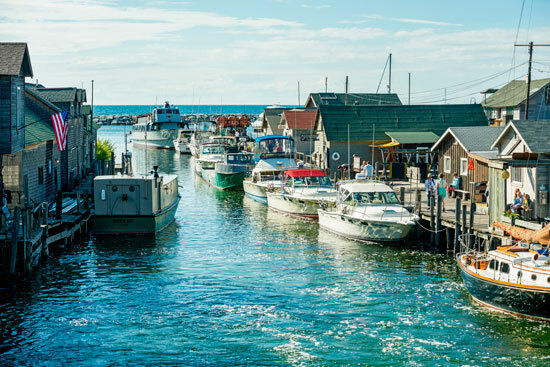 Glen Arbor and Leland's "Fishtown" are top visitor destinations with friendly locals ready to welcome you in. Rock hounds enjoy looking for the beautiful Leland Blue stones on Van's Beach downtown. If you make it all the way to Northport at the tip, you’ll find yourself in a more secluded region, surrounded by nature and unspoiled by heavy tourism. Heading back south on the last leg of M-22, you will pass through Suttons Bay, a very nice waterfront community with specialty shops and eateries. The journey ends in Traverse City, an up-and-coming, energetic city and the cherry capital of the world. Traverse City has two bays separated by the Old Mission Peninsula, which offers a another great road trip tour--shorter, but scenic, with country farms and vineyards galore. For more information, read our story about M-22 in Leelanau County. Whatever adventure you are looking for, you will find it on M-22. Eat at restaurants where service is characterized by smiles and locally grown food. Drink and be merry at one of several breweries and wineries. Fish in mighty Lake Michigan, or one of the many lakes and rivers along the way. Shop in unique boutiques crafted with flair and small-town friendliness. 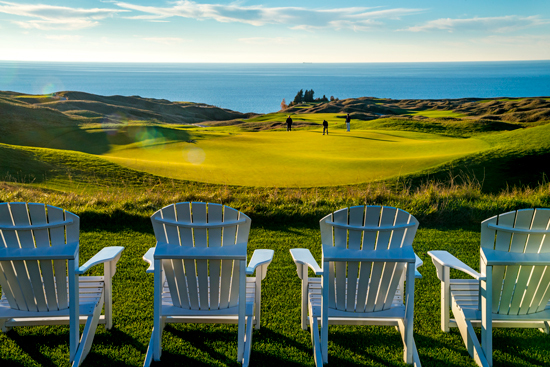 Enjoy world-class golf, hiking, artists, water recreation and much, much more. It's well worth the trip when you travel on M-22 in Northwest Michigan. The scenery will amaze you … and the towns will welcome you!